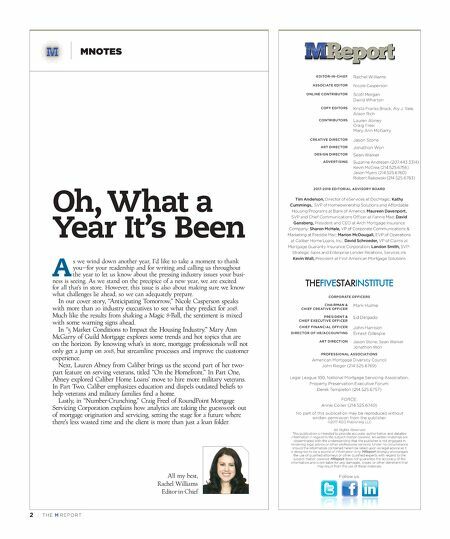 MNOTES Oh, What a Year It's Been A s we wind down another year, I'd like to take a moment to thank you—for your readership and for writing and calling us throughout the year to let us know about the pressing industry issues your busi- ness is seeing. As we stand on the precipice of a new year, we are excited for all that's in store. However, this issue is also about making sure we know what challenges lie ahead, so we can adequately prepare. In our cover story, "Anticipating Tomorrow," Nicole Casperson speaks with more than 20 industry executives to see what they predict for 2018. Much like the results from shaking a Magic 8-Ball, the sentiment is mixed with some warning signs ahead. 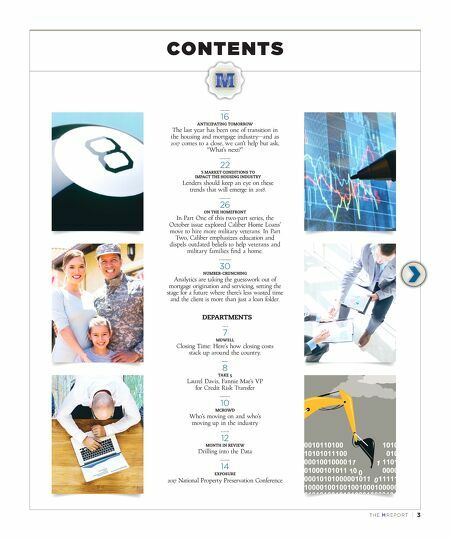 In "5 Market Conditions to Impact the Housing Industry," Mary Ann McGarry of Guild Mortgage explores some trends and hot topics that are on the horizon. By knowing what's in store, mortgage professionals will not only get a jump on 2018, but streamline processes and improve the customer experience. Next, Lauren Abney from Caliber brings us the second part of her two- part feature on serving veterans, titled "On the Homefront." In Part One, Abney explored Caliber Home Loans' move to hire more military veterans. In Part Two, Caliber emphasizes education and dispels outdated beliefs to help veterans and military families find a home. Lastly, in "Number-Crunching," Craig Freel of RoundPoint Mortgage Servicing Corporation explains how analytics are taking the guesswork out of mortgage origination and servicing, setting the stage for a future where there's less wasted time and the client is more than just a loan folder. All my best, Rachel Williams Editor-in-Chief © 2011 First American Financial Corporation and/or its affiliates. All rights reserved. YOUR business is OUR business! First American Mortgage Services is laser focused on mitigating YOUR cost, risk and exposure by aligning our advanced solutions with YOUR strategic objectives and compliance needs. We are the New First American, over 120 years young, strong and financially secure. Insight | Innovation | Integrity First American Title Insurance Company and First American Mortgage Services make no express or implied warranty respecting the information presented and assume no responsibility for errors or omissions. FIRST AMERICAN and FIRST AMERICAN TITLE are trademarks owned by First American Financial Corporation. 2 | Th e M Rep o RT Publisher Jon Ball contributing editor Abby Gregory online editor theMrePort.coM Ryan Schuette coPy editors Alison Rich emily White Youree heather hill contributors phil Britt Bob Calandra eric Fox Jack Konyk Mark Lieberman creative director Jason Stone art director Jonathan Won associate art directors Bruce Sons Chanyanont Loha-Unchit design director Sean Walker advertising Dina Duncan (214.525.6740) Jason Myers (214.525.6760) Andi Zimmerman (214.525.6724) technology Toby Tull Brandon Shangraw social Media Leon McKenzie Ani Vera circulation/corresPondence Celina Avila corPorate officers chairMan & chief creative officer chief executive officer Mark hulme edward R. Delgado business develoPMent Andi Zimmerman chief financial officer John harrison director of huMan resources ernest Gillespie director of oPerations Toby Tull account executives senior account executive Donna Lott (214.525.6792) sPonsorshiPs Jason Myers (214.525.6760) account executives Renee Charles (214.525.6742) Thomas Griffin (214.525.6754) Kristin Larson (214.525.6713) Ryan McLemore (214.525.6706) Marketing Travis Bogdon Matt hulme Production Kyle Curtis Miguel Martinez Christian McCrossan concierge Celina Avila art direction Jason Stone Sean Walker Jonathan Won No part of this publication may be reproduced without written permission from the publisher. ©2011 Reo publishing LLC All Rights Reserved This publication is intended to provide accurate, authoritative, and detailed information in regard to the subject matter covered. All written materials are disseminated with the understanding that the publisher is not engaged in rendering legal advice or other professional services. Under no circumstance should the information contained herein be relied upon as legal advice as it is designed to be a source of information only. MReport strongly encourages the use of qualified attorneys or other qualified experts with regard to the subject matter covered. MReport does not guarantee the accuracy of the information and is not liable for any damages, losses, or other detriment that may result from the use of these materials. FORDEFAULTSERVICINGPROFESSIONALS THEFIVESTARINSTITUTE Follow us. 2 | TH E M R EP O RT EDITOR-IN-CHIEF Rachel Williams ASSOCIATE EDITOR Nicole Casperson ONLINE CONTRIBUTOR Scott Morgan David Wharton COPY EDITORS Krista Franks Brock, Aly J. Yale, Alison Rich CONTRIBUTORS Lauren Abney Craig Freel Mary Ann McGarry CREATIVE DIRECTOR Jason Stone ART DIRECTOR Jonathon Won DESIGN DIRECTOR Sean Walker ADVERTISING Suzanne Andresen (207.443.3314) Kevin McCrea (214.525.6756) Jason Myers (214.525.6760) Robert Rakowski (214.525.6783) 2017-2018 EDITORIAL ADVISORY BOARD Tim Anderson, Director of eServices at DocMagic; Kathy Cummings, SVP of Homeownership Solutions and Affordable Housing Programs at Bank of America; Maureen Davenport, SVP and Chief Communications Officer at Fannie Mae; David Gansberg, President and CEO at Arch Mortgage Insurance Company; Sharon McHale, VP of Corporate Communications & Marketing at Freddie Mac; Marion McDougall, EVP of Operations at Caliber Home Loans, Inc.; David Schroeder, VP of Claims at Mortgage Guaranty Insurance Corporation; Landon Smith, SVP- Strategic Sales and Enterprise Lender Relations, ServiceLink Kevin Wall, President at First American Mortgage Solutions CORPORATE OFFICERS CHAIRMAN & CHIEF CREATIVE OFFICER Mark Hulme PRESIDENT & CHIEF EXECUTIVE OFFICER Ed Delgado CHIEF FINANCIAL OFFICER John Harrison DIRECTOR OF HR/ACCOUNTING Ernest Gillespie ART DIRECTION Jason Stone, Sean Walker Jonathon Won PROFESSIONAL ASSOCIATIONS American Mortgage Diversity Council John Rieger (214.525.6769) Legal League 100, National Mortgage Servicing Association, Property Preservation Executive Forum: Derek Templeton (214.525.6757) FORCE: Annie Collier (214.525.6740) No part of this publication may be reproduced without written permission from the publisher. ©2017 REO Publishing LLC All Rights Reserved This publication is intended to provide accurate, authoritative, and detailed information in regard to the subject matter covered. All written materials are disseminated with the understanding that the publisher is not engaged in rendering legal advice or other professional services. Under no circumstance should the information contained herein be relied upon as legal advice as it is designed to be a source of information only. MReport strongly encourages the use of qualified attorneys or other qualified experts with regard to the subject matter covered. MReport does not guarantee the accuracy of the information and is not liable for any damages, losses, or other detriment that may result from the use of these materials.